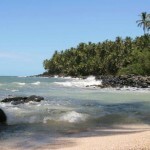 Cheap flights to French Guiana in South America from €230! A bit more experienced travellers may consider promotional offer of Air Caraibes or Air France offering cheap non-stop flights to Cayenne, capital and the largest city of South American country French Guiana. (French overseas territory). Considering usual rate ex major European airports goes for €700 and up this is great solution for vast travellers in Europe. If you are looking for unusual destination in South America you may consider this offer from Paris Orly – roundtrip flights are available from €230. All taxes are included in this fare. Note that the cheapest tariff does include checked bag. Available for additional €40 each way..
French Guiana offers one of the highest qualities of life in South America, due to its colonial status within the French Empire. It is the only country in the entire Americas in which the Euro is used as currency. Currently running promotion of Air France or Air Caraibes allows to purchase tickets at the lowest fare when travelling in April and beginning of May 2019. (Latest date of your inbound flight from South America). Max stay 1 month. As per Air France promotional conditions this deal is valid for bookings made till 19th of April.. If interested you can easily compare travel dates via Google Flights. Alternatively you can check all details directly at the website of Air France or Air Caraibes. Also follow the links if you prefer direct booking with the airlines. Max length of stay is one month and as said base tariff does not include checked in luggage. Need an accommodation in Cayenne, South America, consider service of Hotels.com or Booking.com. Before you book please consider the travel dates of your trip. French Guiana is a tropical country with a serious rainy season. The best season to visit is from July to December which is considered as dry period. Thanks to Paris is connected by many low-cost airlines with other European cities this is quite amazing promotion. The quickest way to compare your connection flights between your home city and Paris is through Skyscanner. Last but not least we should mention that these are in most of the cases direct flights between Paris and French Guiana..
Booking sample of a roundtrip flight to French Guiana for €230. In this case you would be flying from Paris to Cayenne on 25th of April. Return flight from South America back to Europe would be on 5th of May 2019.